Here's the first of a series featuring models Aurora and Genevieve with Chinese opera-style makeup by Tessa Mitz. Here are more photos from the shoot with Aurora and Genevieve. See Part 1 here. The idea for the shoot was to have two models - one Asian and one Caucasian - and have slightly over-the-top asian makeup based on the style of Chinese opera makeup. We shot on location at the Spectral Theatre, unhealthy which was a great place for the shoot. We used both the stage and dressing room areas. I loved the creepy sci-fi and horror props that were stored in the theatre, sildenafil which inspired more ideas for future shoots! This is the third in a series of sugar skull inspired collaborations that I have done with Jennifer Ruth, and several different models, hairstylists and fashion stylists. The previous shoots were Winter Muertos - In the Darkness of Winter and Primavera de Muertos, each following a seasonal theme. I also collaborated with Catriona Armour and Kyla Lee for my first sugar skull photoshoot last year. The images for all these shoots were inspired by the beautiful artwork of Sylvia Ji and the very cool work of 666photography. The Día de los Muertos sugar skull shoots have resulted some of my post popular photos. I've been fortunate to work with very talented teams - the models, makeup, hair and fashion styling have been amazing! I love the photos and proud to have them in my portfolio. I will be doing at least one more for the autumn season, and probably some others in the future because they have so many creative possibilities! Click on the image below to see more photos from the Summer Sugar Skull shoot. Here are some images from a recent collaboration that I did with makeup artist Meghan Thomas and actor, model, dancer Genevieve Clements. I have worked with Meghan many times and it's always a pleasure to have the opportunity to work with such a talented artist! This was the second photoshoot that I did with Genevieve. As an actor and dancer, Genevieve has great expression and body awareness, which makes her a wonderful photography model to work with. In preparation for the shoot, I read up on the Greek myth of Medusa (in Wikipedia of course!) and found out that she had two sisters, both also Gorgons - monsters with snakes for hair and the power to turn anyone to stone with their gaze. Her sisters were immortal, but Medusa was not, and was killed by Perseus by chopping off her head. The winged horse Pegasus sprung from Medusa's blood. Pegasus was the offspring of Medusa and the god of the sea Poseidon. In ancient times, Medusa was monstrous in appearance, but later was depicted as beautiful (except for the snakes). In this shoot, we wanted to invoke the symbolism of Medusa - a combination of feminine beauty and snake imagery. We did two different sets - the first was shadowy with a dark background and lighting to show the body painting work. For the second set, I used a handpainted background featuring ancient Greek columns to go with the Greek myth theme. Here's a photo gallery with more images from the shoot. a body of words and the systems for their use common to a people who are of the same community or nation, the same geographical area, or the same cultural tradition: the two languages of Belgium; a Bantu language; the french language; the Yiddish language. The concept for one of my recent photoshoots was "language." Languages can be written using alphabets, characters or hieroglyphics. Some languages are spoken but not written, others are only written. Many languages have been lost and no one knows what might have been said with them. Music is a language. There are programming languages, symbolic logic and mathematics. But languages can also be non-verbal: gestures, body language, sign language or facial expressions. 8. any system of formalized symbols, signs, sounds, gestures, or the like used or conceived as a means of communicating thought, emotion, etc. : the language of mathematics; sign language. Languages can be chemical - pheromones or the genetic code of DNA. In the short story "The God's Script" in Labyrinths: Selected Stories & Other Writings , by Jorge Luis Borges, an Aztec priest searched for a divine message in the spots of a jaguar. I'm intrigued by the idea that one language could express ideas that cannot be expressed in another. There is a visual language used in photography that communicates ideas and emotions that cannot be expressed by words. Is is possible that anything can represent anything else if we know how to translate or decode the message? A photographer friend, who knows that I like to play around with old cameras, lent me her Minolta Maxxum 7xi (also known as the Dynax 7xi) to try out. Released in 1991, it was an advanced 35mm SLR camera for its time, with many innovative features. One of the coolest things about this camera are the expansion cards that it has for different creative program modes. They are intended to make the camera easy to use - just load the card and set the camera to P (program). I guess in 1991 it was not feasible to build all of the programs into the camera like modern cameras. I tried out the camera during a studio shoot using manual exposure, without the expansion cards. I attached a CyberSync to the hotshoe using a Minolta/Sony hotshoe adapter because the Minolta uses a proprietary hotshoe system (same as the Sony Alpha system). I set the shutter speed to 1/60th sec because I wasn't sure about the camera's sync speed. I looked it up later and found it is 1/200th sec, which is pretty good. I loaded the camera with Kodak Ektar ISO 100 colour negative film. Heavy, especially for traveling or hiking. This shoot was based on the Mexican holiday Dia de los Muertos (Day of the Dead), treatment but with a Spring blossom twist. 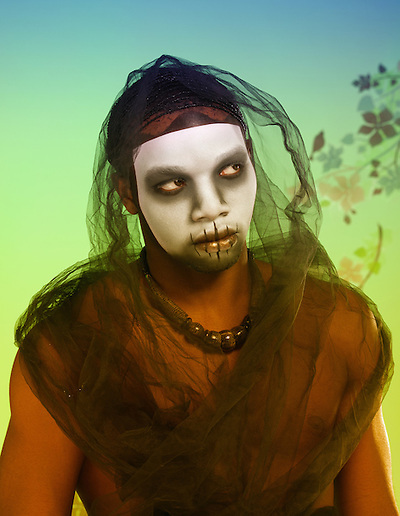 The makeup was inspired by calaveras de azúcar (sugar skulls) that are given as offerings to the dead on November 1, and by the work of 666 Photography and the art of Sylvia Ji. The Day of the Dead festival originated with the ancient Aztecs and was dedicated to the goddess Mictecacihuatl, the queen of Mictlan, the Aztec underworld who keeps watch over the bones of the dead. Her husband is Mictlantecuhtli, was the Aztec god of the dead, Lord of Mictlan. The celebration continues today in Mexico and parts of the United States. This is the second Dia de los Muertos shoot in a series. The first was In the Darkenss of Winter and the next two are in planning stages. Do you have some favourite Day of the Dead images or makeup? Share the links in the comments section below!